Logo is adding another sitcom! The '80s Ted Knight comedy Too Close for Comfort heads to Logo beginning tonight. It airs in a block tonight from 1am-4am (technically early Thursday, Nov. 2). Too Close for Comfort has recently aired on Antenna TV and joins other sitcoms on Logo such as All in the Family, The Facts of Life, Alice, Three's Company, Mama's Family, The Golden Girls, Roseanne and Married...with Children. As with other Logo sitcoms, you'll have to check your listings to see when exactly the series will pop-up, but it will always be in a block format. In the sitcom, when Henry (Ted Knight) and Muriel (Nancy Dussault) have a problem when the downstairs neighbor, Rafkin, a transvestite suddenly dies leaving a vacancy in the townhouse, Jackie (Deborah Van Valkenburgh) and Sara (Lydia Cornell) quickly decide it would be wonderful to move into the apartment. The series aired originally from 1980-86 on ABC and then later in first-run syndication for its final seasons. 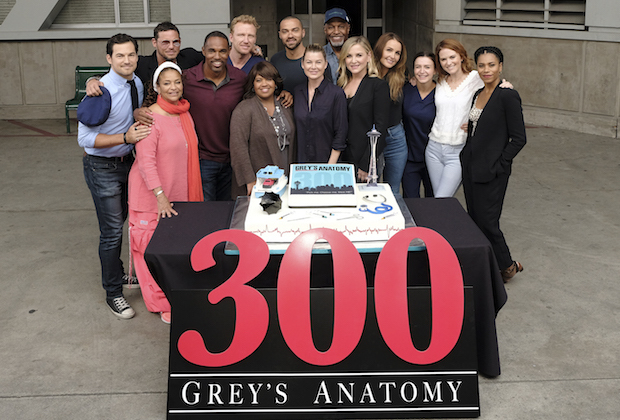 ABC celebrates 300 episodes of the long-running hit drama series Grey's Anatomy with a special "Day of Grey's" on Thursday, November 9. The celebration begins the evening prior on Wednesday, November 8, when Jimmy Kimmel Live! hosts Jesse Williams (Dr. Jackson Avery) as a guest in studio. On November 9, Ellen Pompeo begins the day live in studio in New York at Good Morning America and then segues over to Live with Kelly and Ryan where she'll talk about playing the iconic Dr. Meredith Grey for 14 seasons. From there, Ellen will drop by both The View and The Chew. The 300th episode airs at 8:00 p.m. EST that evening. In this special episode, entitled "Who Lives, Who Dies, Who Tells Your Story," a roller-coaster car falls off the track at the county fair and the doctors at Grey Sloan tend to patients who spark memories about ghosts from their past. Closing out the celebration, Nightline airs an exclusive behind-the-scenes piece on the show with Michael Strahan. Created by Shonda Rhimes, Grey's Anatomy premiered on March 5, 2005. Of the original cast, Ellen Pompeo, Chandra Wilson, James Pickens Jr. and Justin Chambers remain at Grey Sloan Memorial, as the "Core Four."